"We realized that we needed a third party company, which could independently certify our reviews. Unfortunately most of the alternative product reviews sites we initially discovered, such as TrustPilot, seemed to lack the visual and interactive tools we needed. Even worse, they had recently raised their prices to $549 per month, expecting us to agree to a 1 year contract!" 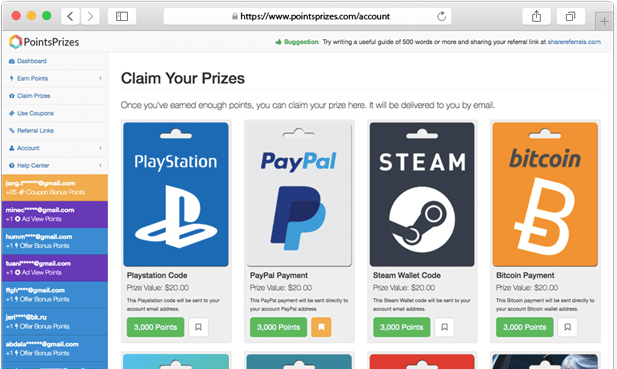 PointsPrizes was founded in 2016, with the goal of providing a safe space for people to earn free gift cards and cash payments online. Users complete paid surveys, offers or watch video ads to earn points. Once they reach the required points total they can choose from a huge array of prizes, including free Steam wallet codes, free PSN codes, free Amazon gift card or even a free PayPal cash payment. It hasn't been easy, but over the years we have earned a reputation as one of the most trustworthy points rewards sites. The 'get paid' industry is often saturated with fake websites that do their best to appear “real” to deceive users – even going so far as to include fake reviews and testimonials on their landing pages. This made it incredibly difficult for legitimate places such as PointsPrizes to separate themselves from the rest of the industry. The challenge for PointsPrizes was further exacerbated by the fact that not every user was eligible to complete certain surveys, which led to a short-term retention issue. PointsPrizes knew the best way to handle this situation was to start collecting reviews and showing those on their site. If prospective visitors could see how much real customers loved using the site and more importantly see photos of payment proof, it would help solve the challenges they faced. We realized that we needed a third party company, which could independently certify our reviews. Unfortunately most of the alternative product reviews sites we initially discovered, such as TrustPilot, seemed to lack the visual and interactive tools we needed. Even worse, they had recently raised their prices to $549 per month, expecting us to agree to a 1 year contract! PointsPrizes discovered TrustSpot after searching for a feature-rich reviews platform that would help them with their challenges. The initial goal was to increase the amount of customer reviews and display them on their site. Soon after, PointsPrizes started accessing our Visual Marketing features, which allows customers to upload photos with their reviews. This photo content allowed PointsPrizes to not only show prospective visitors live payment proof, but it also allowed them to reward customers for engaging more heavily with their site during the review process. TrustSpot provided us with a powerful suite of Visual Marketing and Coupon Incentive tools that helped us collect regular payment proofs from our users. We described our use case and they invested in upgrades to their existing coupon system, to reward our users for attaching images to their reviews and then sharing them on social media. TrustSpot helped PointsPrizes build trust with their users, by collecting a daily stream of company reviews from their users, which was then displayed prominently on their landing pages. They also received a 5-star rating in Google search, due to TrustSpot's use of Rich Snippets - increasing traffic to their landing pages by as much as 35%. PointsPrizes observed an increase in their conversion rate of over 44%. By implementing TrustSpot, not only did PointsPrizes increase their profitability, but they also reduced their costs, with the number of customer support tickets related to trust issues falling by an incredible 71%. 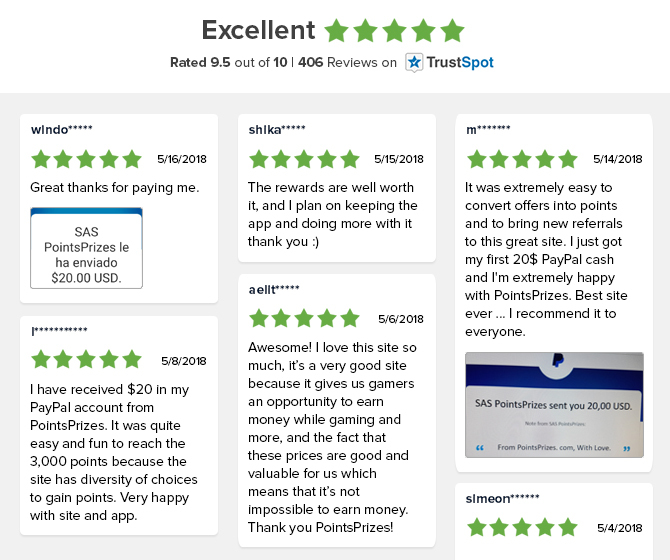 "TrustSpot is now the bedrock of our business, providing us with a daily stream of independently certified reviews and payment proof. It's a great feeling, to finally win the trust and loyalty of our users."